Irreproachable product is the pride of nation. Diploma On the 18th of September the products of “Rakhat” JSC were awarded with the “Irreproachably” national mark of quality under the results of independent examination of consumers, which was organized by Consumers League of Kazakhstan. 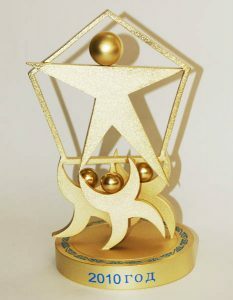 Award The project of “Irreproachably” national mark of quality was created with the purpose to form the civilized relationships on the market of goods and services of Kazakhstan, to improve the images of manufacturers, who take care of the quality of their products, services and works, and of market protection from dishonest entrepreneurs as well. By means of public opinion polls, representative polls of citizens by telephone, questionnaires, tasting and other research, best manufacturers are selected every year. 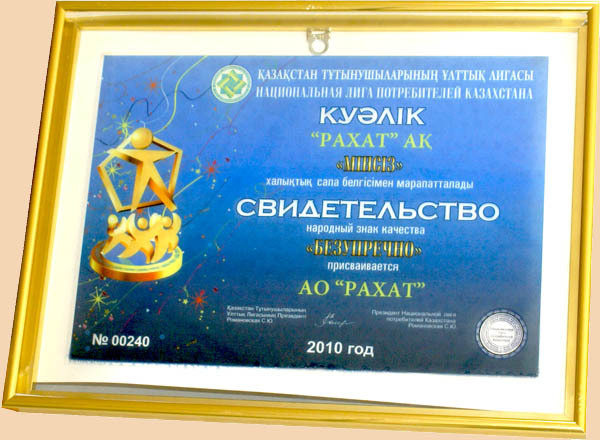 Nomination of confectioneries of “Rakhat” JSC with the “Irreproachably” national mark of quality in such serious and conscientious project confirms the recognition of our products by consumers of Kazakhstan and good reputation of the company.